This is always so much fun. I recently enjoyed a dinner with friends Patty, Jan and Nancy--"dragonfly" friends. When I lived in Portland, we used to have dinner together and also do other things together. Patty is the only one who still lives in Portland. I am in DC, Jan is in Arizona, and Nancy is in Springfield Arizona. We were able to get back together on June 30 at Patty's place. It was a real treat. We usually exchange gifts at the dinners. I had unfortunately left my gifts for the others back in DC, but will soon get them in the mail....as well as the thank you notes for the gifts that were given to me. Patty gave me an Oregon "Roots" mug. 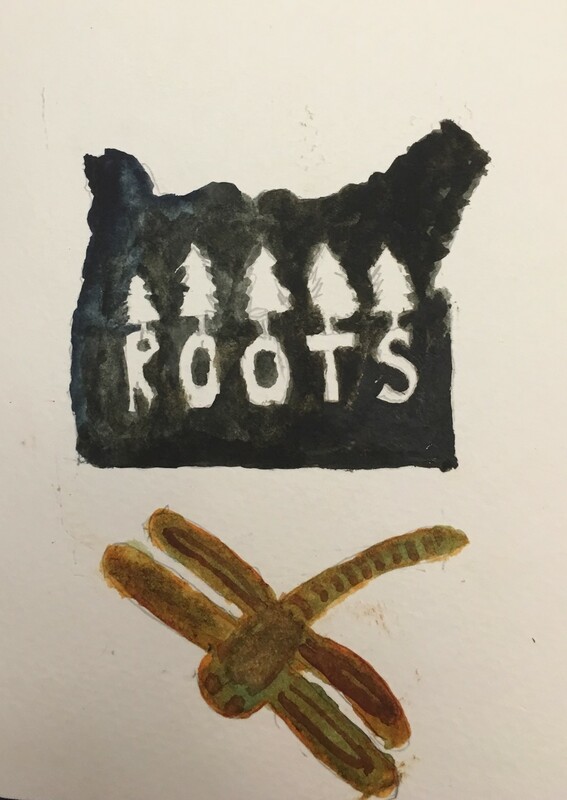 I didn't paint the mug, but made a painting on the thank you card of a black Oregon state image with trees and the word "ROOTS" on the black field. I love Patty's reminder that I put down roots in Oregon. She also took me to the Lan Su Chinese Garden, where she is a member, and surprised me with a cast dragonfly from their gift shop. Patty also hosted me for the whole trip---several days. We had lots of fun times together and some delicious meals. Thank you Patty for making all this possible.